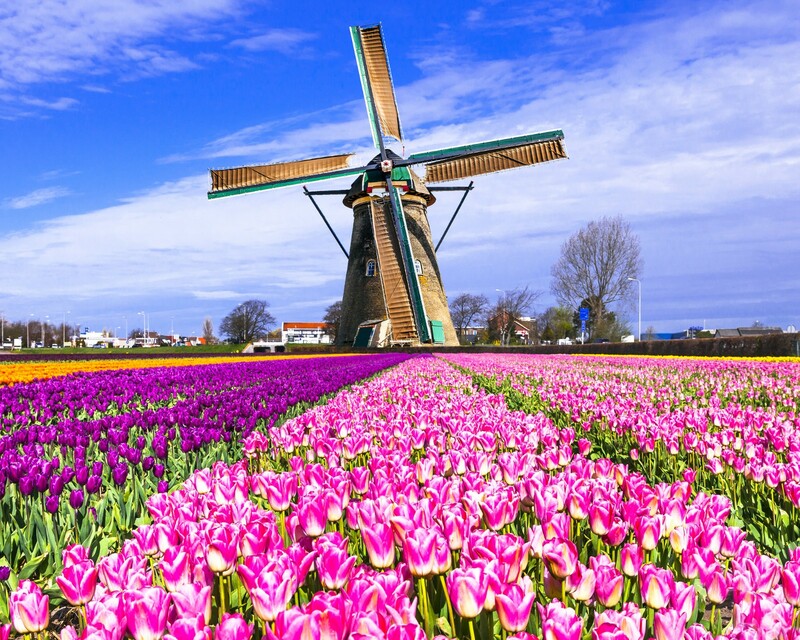 We currently offer 14 days, 10 days, and 8 days biking and boating from Amsterdam to Bruges in Tulip Season and now we are please to present this 9 day tour from Holland's intriguing capital to Belgium's artistic gem. Perhaps 9 will be your magic number and there will be magic on this tour! 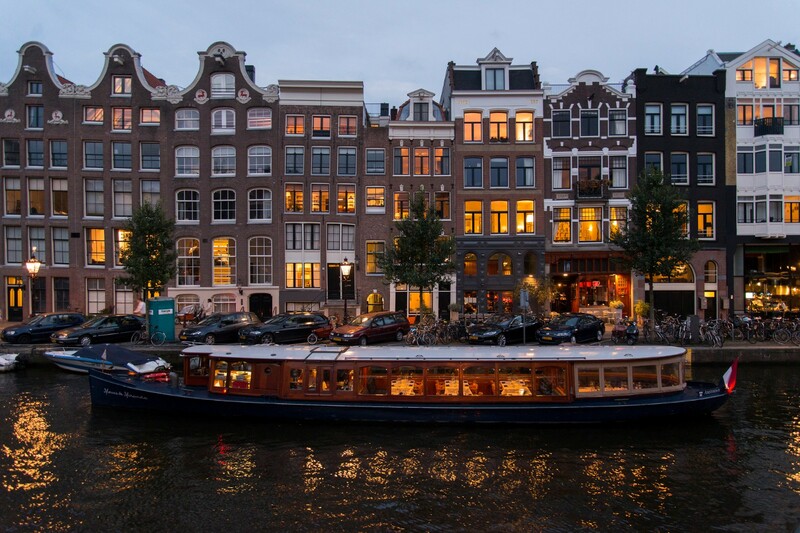 You will enjoy the magic of the Iris, your accommodation. This is a premium ship that feels like home. 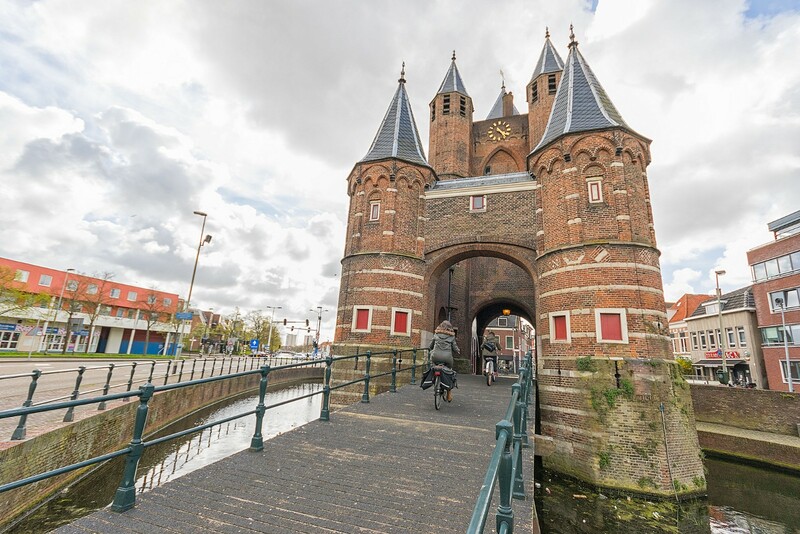 You will be astounded with the magic of cycling in Holland and Belgium on one of the world's most developed cycling infrastructures. 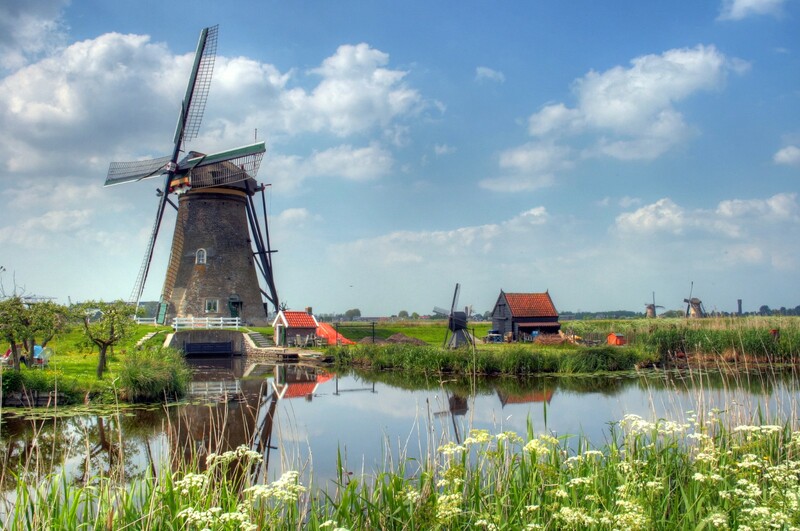 The magical landscape and light that so many Dutch and Flemish masters captured in their paintings is breathtaking and cycling during tulip and spring flower season adds to the palette. 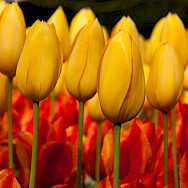 Highlight of this tulip themed bike and boat tour is a visit to the world famous Keukenhof, which will be ablaze with colors. 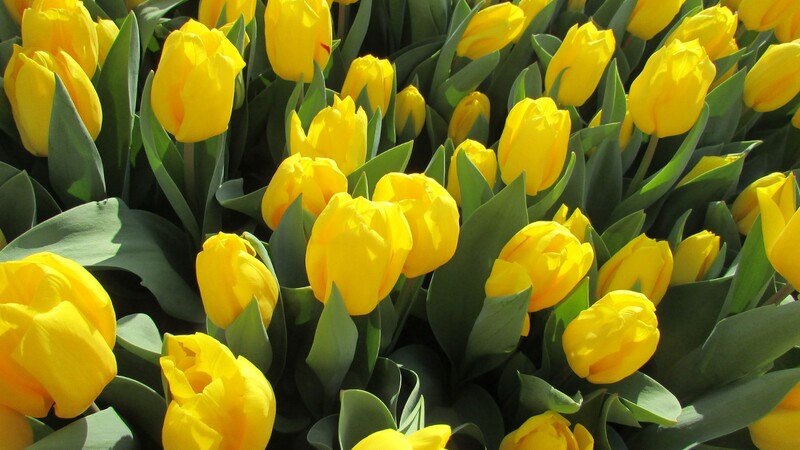 In fact, all of Holland and Belgium will be bursting with spring. 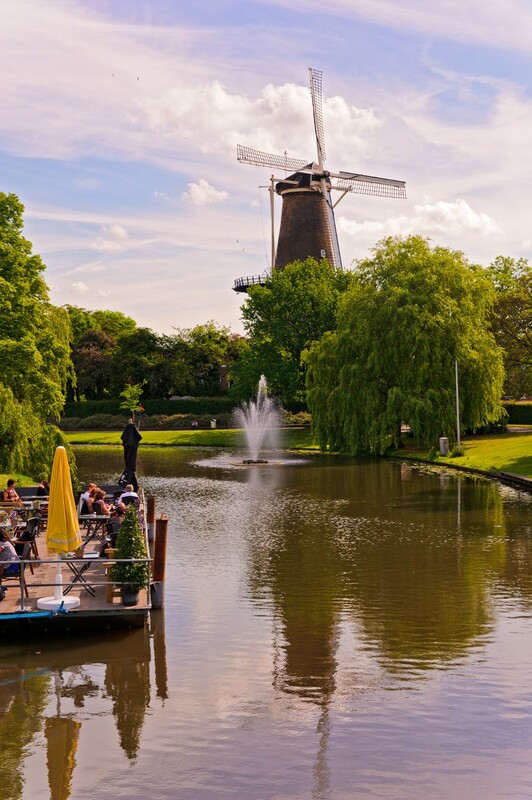 Perfect combination with short visit of the Netherlands before starting your tour! 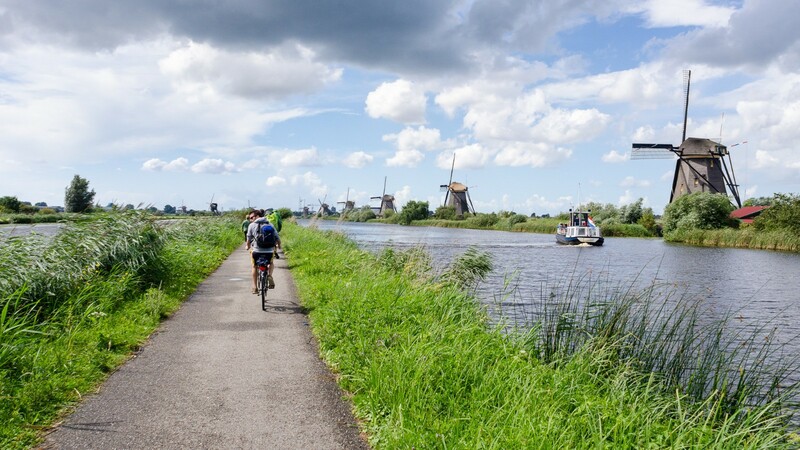 Be sure to check out all of our bike and barge tours in the Netherlands. 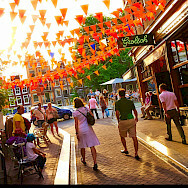 Most people opt to fly into and out of Amsterdam Schiphol International Airport (AMS). However, you can research flying out of Brussels at the end of your tour. 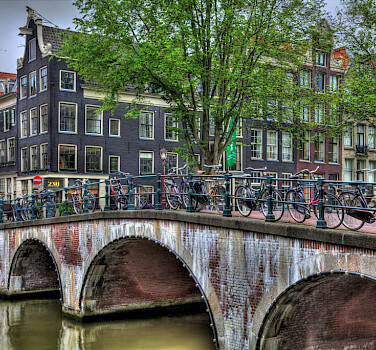 From the Schiphol airport in Amsterdam, you can take the train to Amsterdam Central. Tickets can be purchased at the ticket counter in the Arrival’s Hall of the airport, or at ticket machines located in the airport terminal (NS train station). From there you head down the escalator to the train terminal. 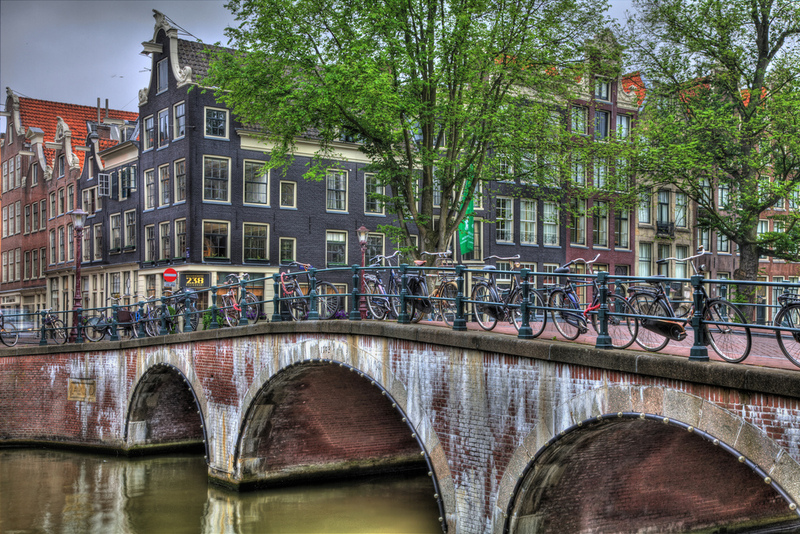 The train ride from the airport to Amsterdam Central takes about 15‐20 minutes and costs only a few Euros. 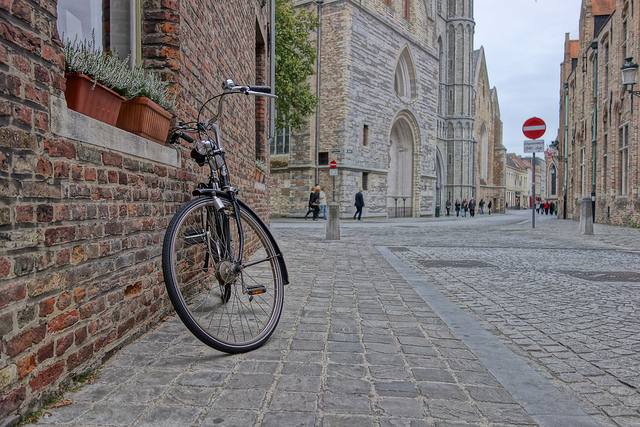 At the end of your tour in Bruges, the train station is within walking distance though many opt for taxi due to luggage and cobblestones! 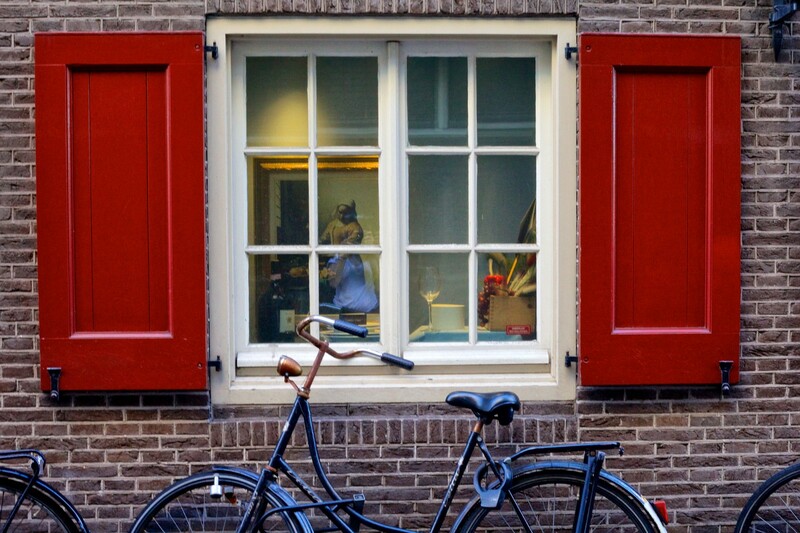 Amsterdam is approximately 3 1/2 hour train ride away and Brussels is approx. 1 1/2. Both airports have train stations in the lower level. Please check local conditions before travel. A very good website to research regional weather is weatherbase.com. The climate in Holland is considered maritime, greatly affected by the sea. 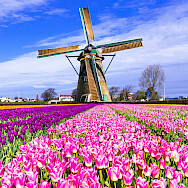 Belgium as well is influence by the North Sea and Atlantic Ocean, with cool summers and moderate winters.The Dutch have a saying "April doet wat hij wil". 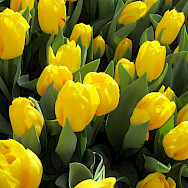 It means that April does whatever it wishes to do. Keep this in mind as you pack for your cycling holiday. 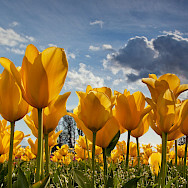 Though cooler in April the sun does shine on average 177 hours. 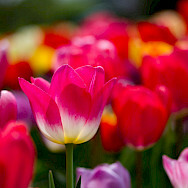 Average high temperature is 55° F (12.8° C) and average low is 38° F (3.3° C). 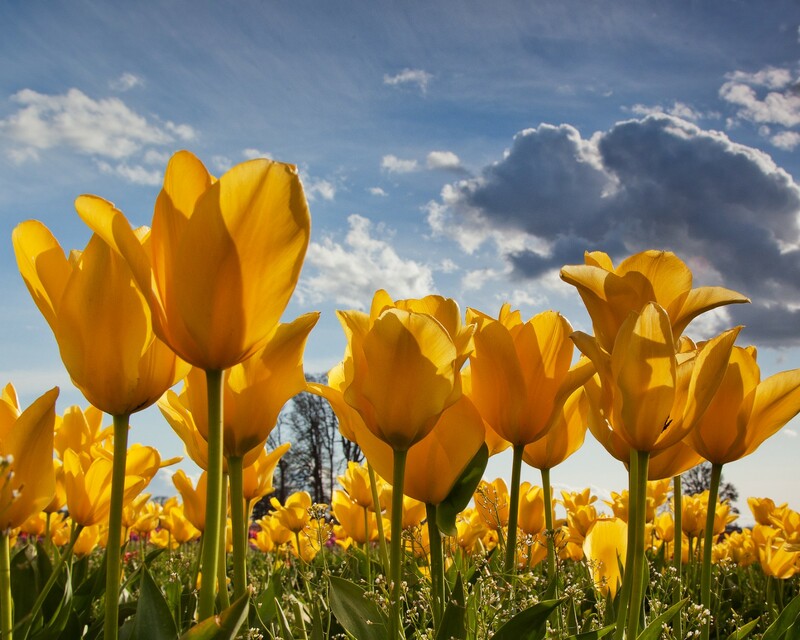 April is normally the driest month of the year but that does not mean it does not rain. Average rainfall is 1.8 inches (47 mm). Rain showers are common and frequent but not long. Plan to dress in layers! 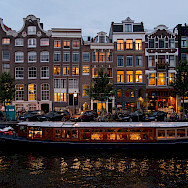 This is an easy 9 day guided bike and boat tour. 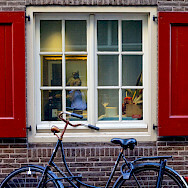 Bicycle routes follow mainly flat designated bike paths and country lanes with little traffic. 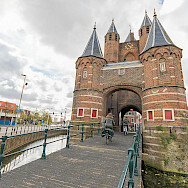 Occasionally heavier traffic is encountered when entering or exiting the bigger cities but this region is very accustomed to cyclists and very accommodating as well. Daily cycling distances average 25 miles (40 km). 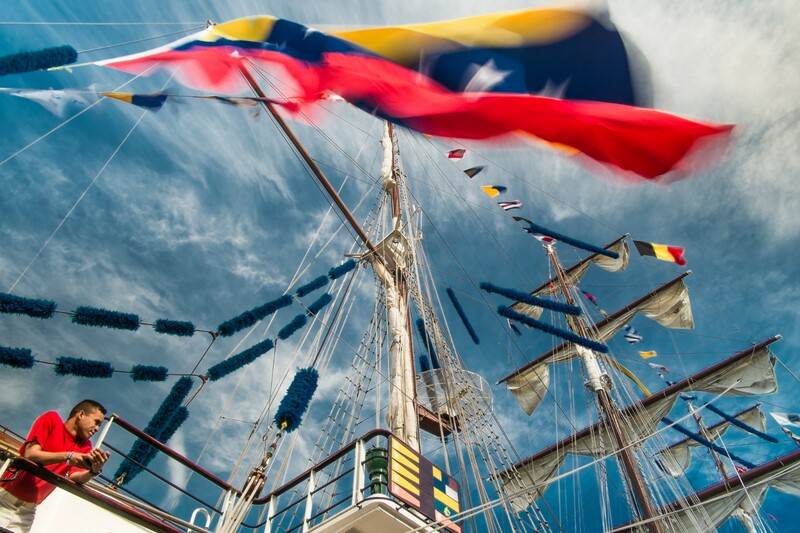 *All itineraries are subject to change due to changing wind and weather conditions and other unforeseen circumstances having to do with mooring requirements, etc. Distances are approximate. 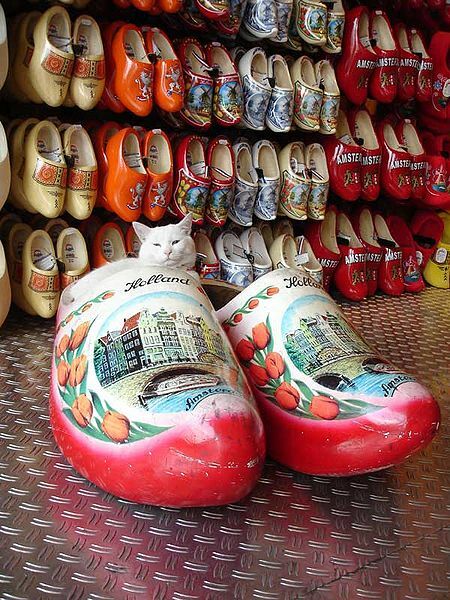 Embarkation in Amsterdam. 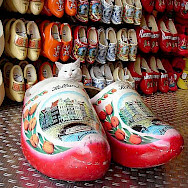 Be sure to be on time as the Iris will set sail, leaving the capital, and heading for the North Sea. 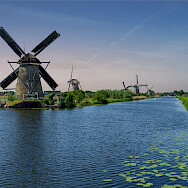 Before Haarlem, you can begin cycling as the boat motors on. Enjoy your first bike ride through the dunes and forest. 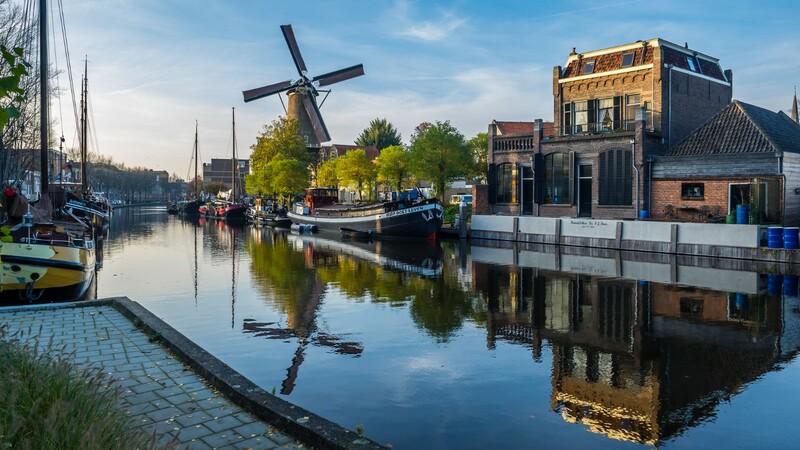 Once in Haarlem, and back on board, mingle with your fellow travelers, enjoy dinner, and perhaps take part in an evening city walk. 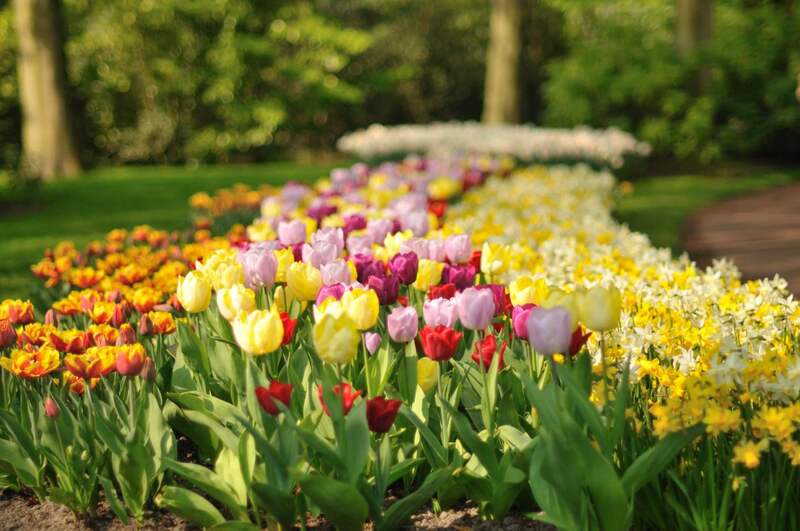 You do not have to wait long on this tour before enjoying one of the main highlights: the Keukenhof! This is the World's garden. 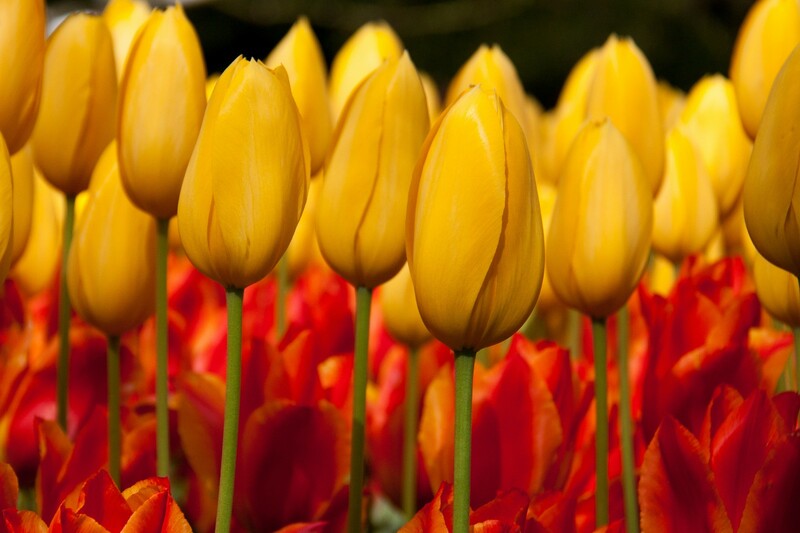 Take in the sight of 7 million flowering tulips in a traditional and modern landscape. 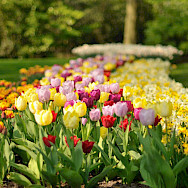 And not just tulips, there are hyacinths, narcissus, and much m ore. 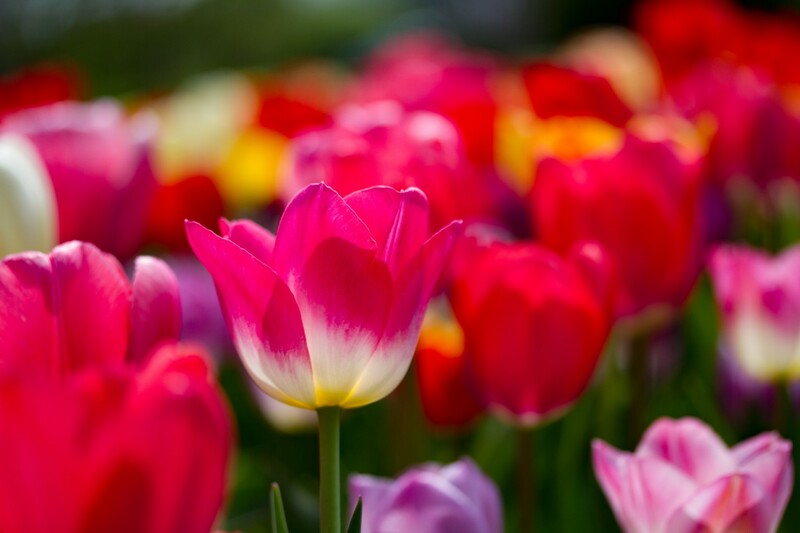 These gardens are visited by millions of guests every year. So be prepared to hear every foreign language you can imagine. 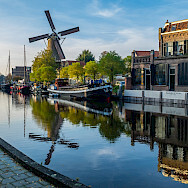 The Iris moors this evening in the old town of Leiden, in the city canal that surrounds the old part of Leiden, once a defense against the Spanish soldiers. 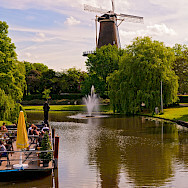 After an early sail out of Leiden, the first stop will be at a cheese farm, to experience this essential Holland. 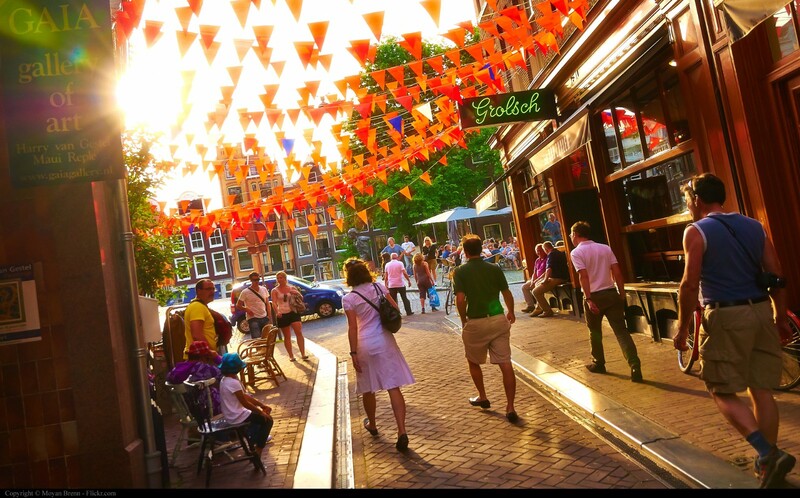 Gouda is one of the most popular and exported cheeses of the Netherlands and therefore the city center has many cheese shops! The Town Hall ast the market square dates back to the 17th century. The Sint Janskerk here is a large Gothic church, known especially for its stained glass windows, for which it has been placed on the UNESCO list of Dutch monuments. 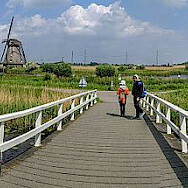 The route then leads right to the windmills of Kinderdijk! 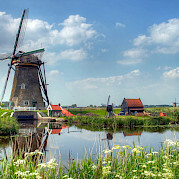 Another essential Holland. 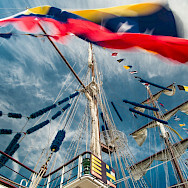 Back on board, the boat sails to Dordrecht as you relax and ponder the impressions of the day. 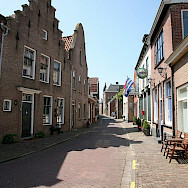 During breakfast, you will cruise to Willemstad, an old fortified town on the Haringvliet. 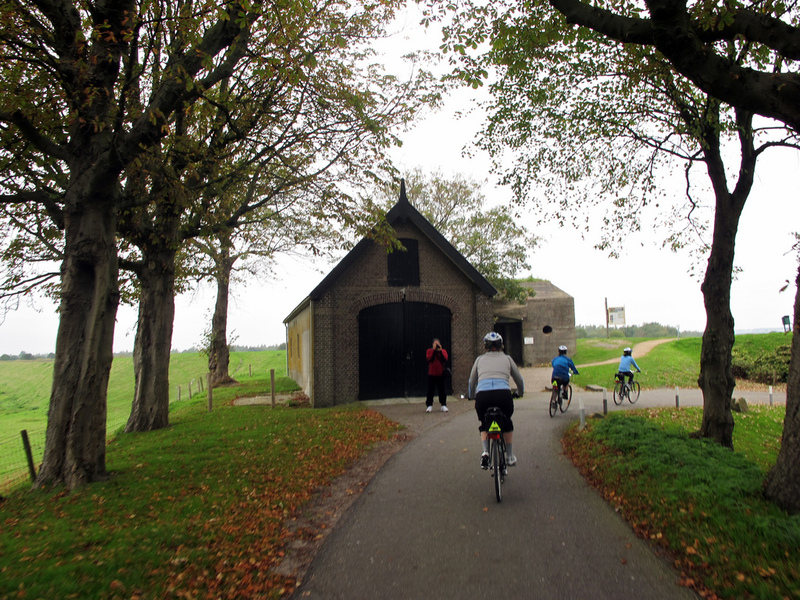 From there you bike along the impressive complex of locks ‘de Volkerak’ to Tholen. 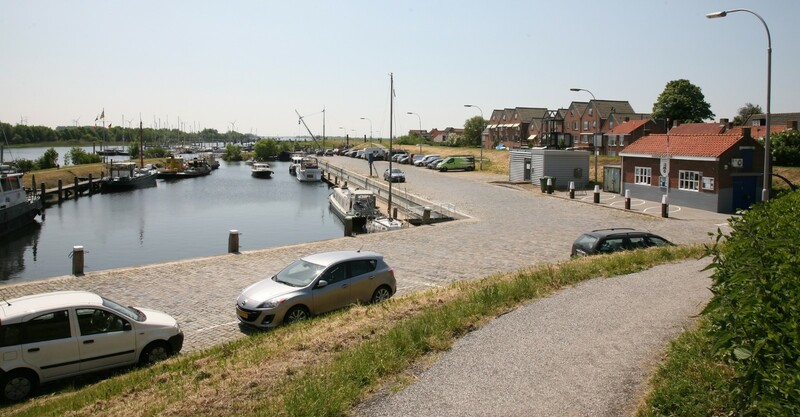 Tholen was an island in the middle of the large Zeeland streams, otherwise known as the Rhein Delta on the North Sea, where many people fished for their living. 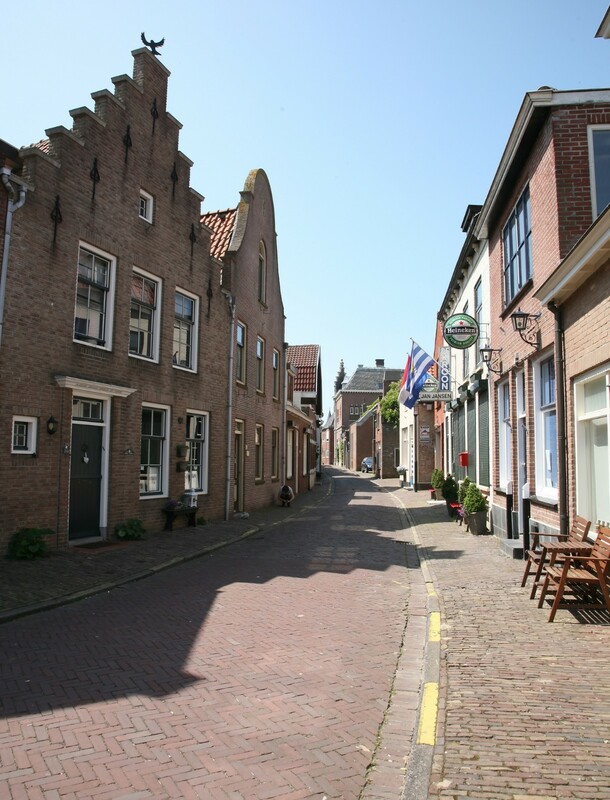 Today Tholen is connected to the mainland, but it retains its picturesque charm and boasts many fishing and boating relics of its colorful past. 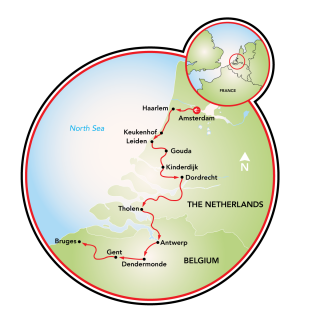 There aren’t many forests in Holland, but you will have the unique thrill of biking through the Wouwse Plantation, an otherworldly landscape of sand dunes (remnents from when the sea was much further inland), mixed oak and conifer forests, alternating with fields of heather and moorlands. 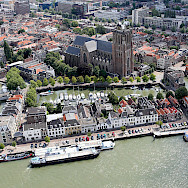 From here, you will cruise to Antwerp’s impressive port and city center. 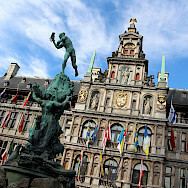 Antwerp is the Diamond City, as well as the home of Flemish Baroque painter, Peter Paul Rubens. In the Cathedral Of Our Lady, you can admire three of his masterpieces. 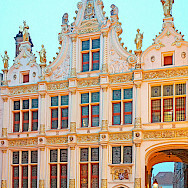 Antwerp’s golden age in the 1500s is tightly linked to the “Age of Exploration.” Antwerp was the sugar capital of Europe, as well as lead importer of pepper and cinnamon. Hundreds of ships would pass in a day with 2,000 carts entering the city each week. 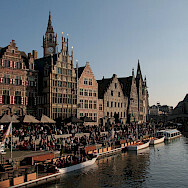 Antwerp was foreign-controlled by aristocratic bankers creating a cosmopolitan city with merchants and traders from Venice, Ragusa, Spain, and Portugal. 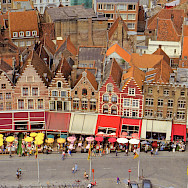 Antwerp was tolerant and attracted a large Orthodox Jewish community. 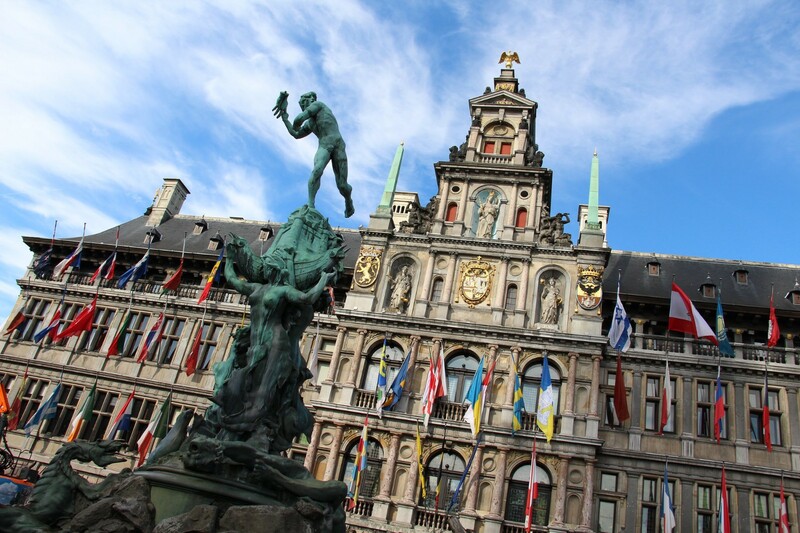 From the 19th century until recently, Antwerp was the world center for diamond refining and trade. After breakfast, the barge locks out of the port to the Zeeschelde. You follow this capricious tidal river upstream to Dendermonde. 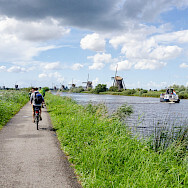 There is a beautiful bike path along the river and the landscape around the Schelde is magnificent. 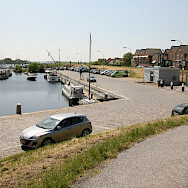 You can join the IRIS halfway in Temse or continue all the way to Dendermonde, a friendly little town along the river. 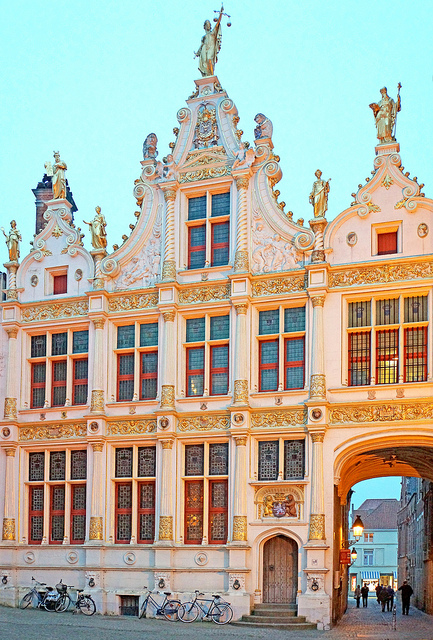 In Dendermonde, you will visit the 14th c. “Clothmaker’s Hall,” formerly a center of wool trade. After WWI, only the stone walls of the building survived. 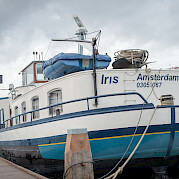 Here you may enjoy local ales in a private beer tasting on board of the IRIS. As they say, When in Rome drink beer in Belgium! 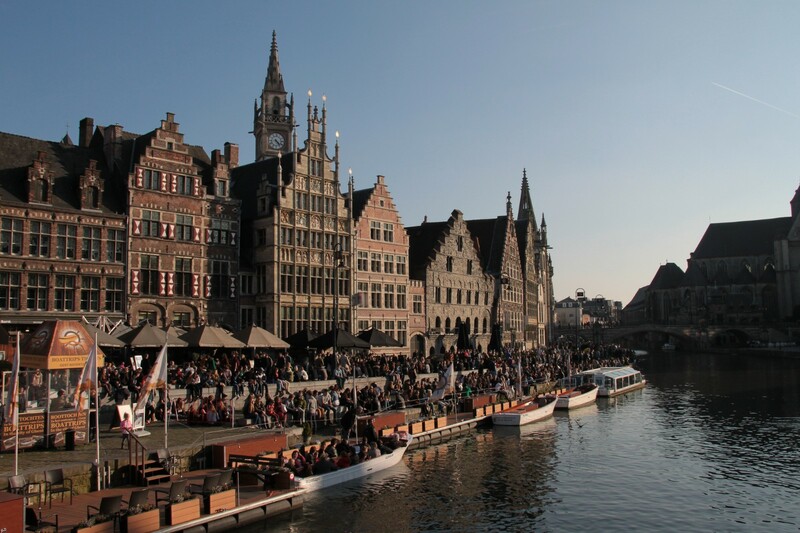 You bike to Ghent, a lively port and university city on the confluence of the Schelde und Leie rivers. 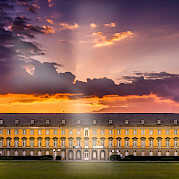 In the afternoon you have the opportunity to discover this historic city that has its origins in Roman Times as they traded and fortified their outposts on the Rhine. 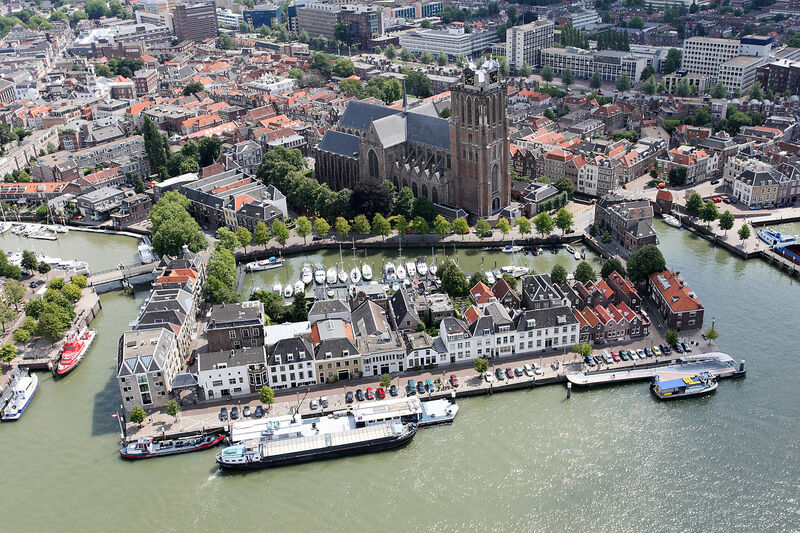 In 800, the town grew when Charlemagne’s court biographer founded St. Bavo (Baafs) Abbey. 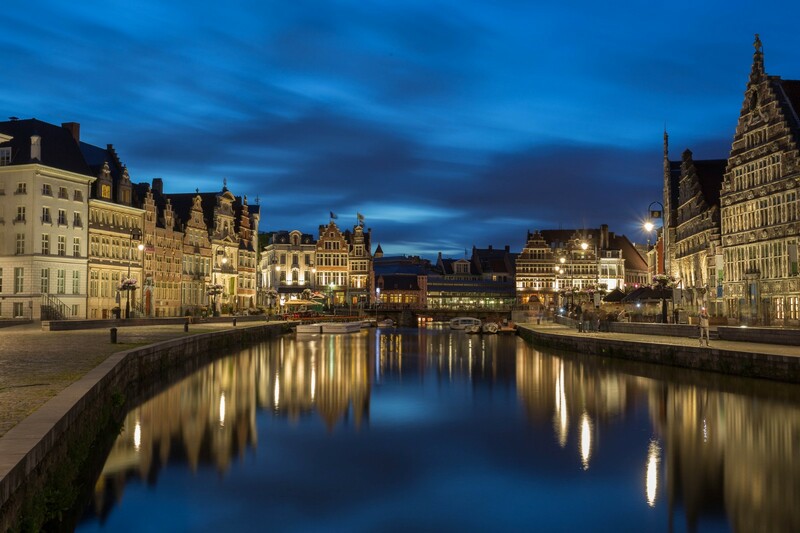 By the 13th century, Ghent became one of the richest cities in northern Europe and biggest city north of the Alps (after Paris)—surpassing Cologne and Moscow! Textile trade and production (mainly wool from Scotland and England) created great wealth. You can still see the well-preserved patrician homes along the Quai aux Herbes dating from the 12c-17c. In St. Bavo (Baafs) Cathedral, admire a number of medieval masterpieces including ‘Adoration of the Lamb’ by Jan van Eyck. 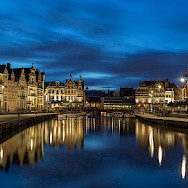 Art lovers will discover great classics in the Ghent’s famous art museum. 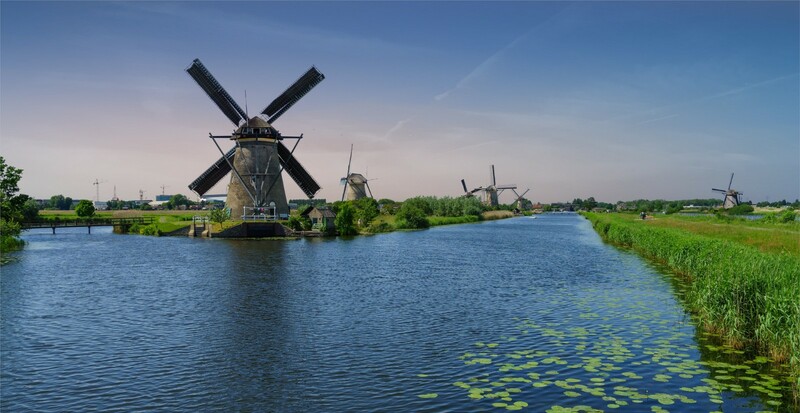 Today the final destination is Bruges, dubbed the darling of Flanders and Venice of the North with its criss-cross of canals and medieval alleys. 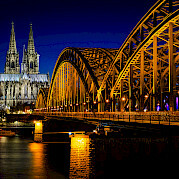 Its center is historically intact and a UNESCO World Heritage Site. 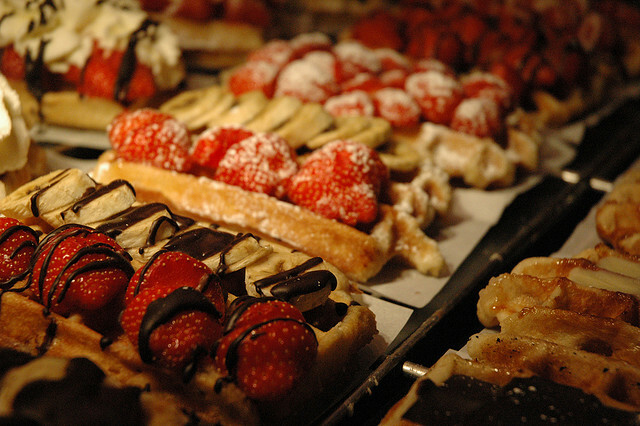 Steep yourself in the Belgian culture. Grab a seat in a cafe at the market square and order mussels and fries (frites & moules), or Belgian stew with crusty bread and a dark ale. Top it off with a visit to Choco Story museum, a fascinating place to learn about how chocolate stormed this nation in the 18th century. Sample a praline or two. If you’re looking for something light to bring home, consider an investment in fine lace. 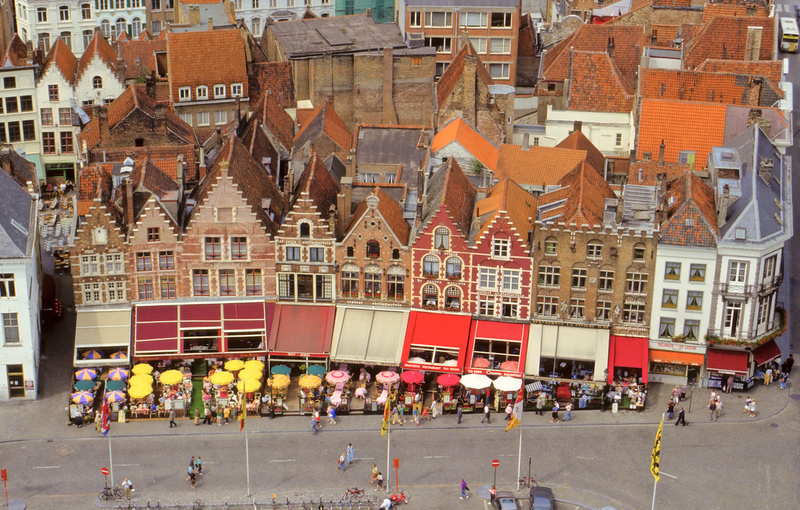 Bruges was the epicenter of exquisite lace for generations. In the 16th century, lace was itemized on aristocratic property lists. It was considered so valuable that those found guilty of smuggling or stealing patterns were harshly punished. An ancient and venerated site is the Basilica of the Holy Blood, stained with Christ’s blood. 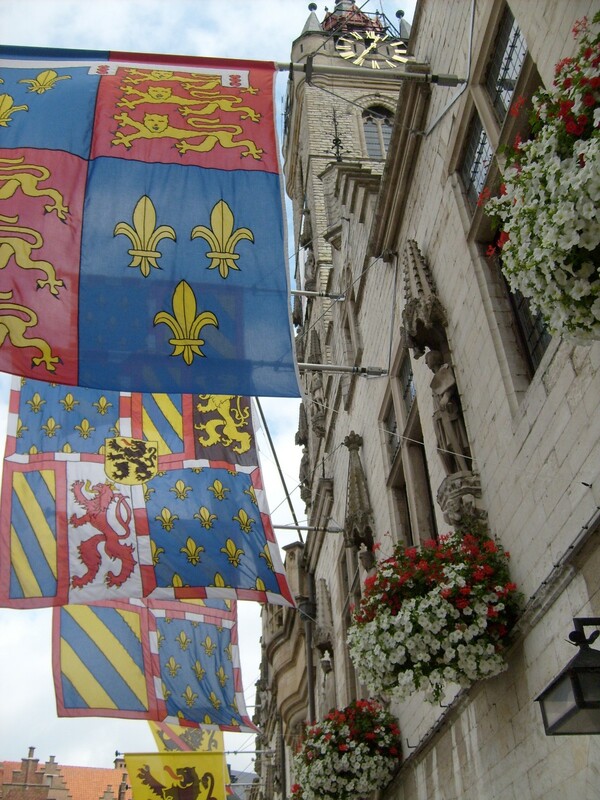 It is the sacred relic of Bruges, an 1134 chapel by the Count of Flanders. 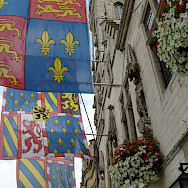 After his 2nd Crusade, he returned to his home city with the Holy Blood, a cloth. 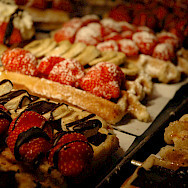 This morning your guided tour ends after breakfast. 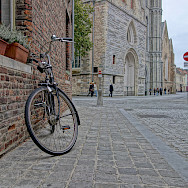 You can leave your luggage untill 12.00 and spend some more time in Bruges. Taxis can be arranged by the ship.